When I was 14 or 15 I went to Reno, Nevada, for either a band festival or a forensic meet. During a slack in the competitions, I stumbled into a drugstore and discovered a rack of paperback PocketBooks. 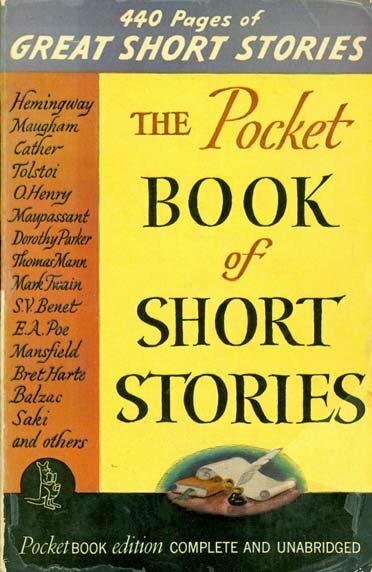 I bought my first, The Pocketbook of Short Stories for 25 cents and went home to Carson City triumphant. I worked evenings and weekends for Kitzmeyer's Drug Store. I had never seen a paperback before, and I decided that this cultural phenomenon should be made available to Carsonites. I told my boss, Chester Cochran, he should stock Pocketbooks. I had to do a lot of persuading, but finally he capitulated. He put their wire, tiered display rack behind the high, large-dial, free scales that all the town frequented to keep tabs on their weight. Everyone hopping on the scales would see the Pocketbook display. I was put in charge of the rack. The books were nicely produced, and their covers were laminated with a thin sheet of cellophane so that they felt smoothly expensive and cleaned easily. Each bore the famous trademark of a pocketed kangaroo with glasses reading a book, paperback, of course. Pocketbooks published a wide variety of subjects, from Ellery Queen mysteries to H. G. Wells histories. One of my regular customers was an urbane woman who was probably in her fifties. I don't think I ever knew her name, and I never associated her with a husband or any children. My guess is that she worked for the state. Most employed adults in Carson City did. One evening she picked from my rack Hugger-Mugger in the Louvre. Amazon describes this as a Homer Evans Murder Mystery: "When Elliott Paul set the conventions of detective fiction on their ear in the Mysterious Mickey Finn, he was just warming up." This is the second mystery in the series. The title was enough to be a mystery to me. Urbane Lady explained that the Louvre was a museum in Paris. Then she spent five minutes trying to teach me how to pronounce Louvre. Whenever she returned to Kitzmeyer's, she re-rehearsed me. It wasn't easy. My foreign language study in high school was Spanish. Louvre was a very strange word in my small-town world. In November, 1948, I found myself with five other newly-off-the-boat elders in Paris, France, waiting for two or three days until our mission president arrived from Switzerland to send us to our first assigned cities. I was 22 and not the callow kid who didn't know how to pronounce Louvre. Our little pack spent the best part of a very cold November day walking the rooms of what is arguably the greatest museum in the world. Since that day I have walked those rich galleries many times, at least once on every occasion I have been to France. On one occasion about ten years ago, when the museum was open at night, I went in at nine in the morning and left towards ten at night. I ate in the museum's cafeteria, and when I became very tired, I'd find a quiet corner, sit down and rest. And probably fall asleep for a few minutes. The guards never disturbed me. The American architect I. M. Pei scandalized the traditional element among the French when he built a large glass pyramid in the center of the palace plaza and created a new, underground entrance to the museum. Today, the French admire the pyramid as much as the Eiffel Tower. Construction of the new sub-plaza created new exhibition and commercial space. It also opened for view the foundation walls from the first versions of the Louvre palace. I have been in all the grand galleries and the off-beat nooks and crannies accessible to visitors. In this vast organized jumble of the world's largest museum, there are paintings that I insist on viewing whenever I visit. 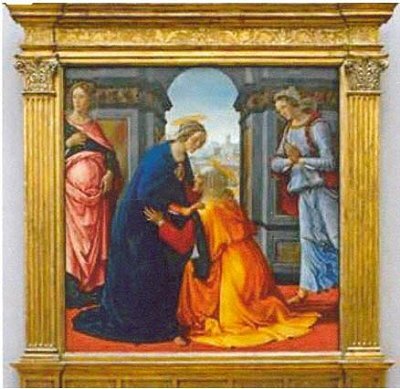 In the greatest gallery, which seems to be almost a kilometer in length (it is not quite), although there is notable painting after another attached to the walls, there is one that I will always seek, one of my favorites in the whole museum: Visitation, painted c. 1491 by Domenico Ghirlandaio. Most visitors probably pass by it quickly. The painting's power over me is not the subject, but the color and compositional dynamics of the painting and its frame. Ghirlandaio worked in Florence, Italy, at the time of the powerful Lorenzo de' Medici and became the official portraitist of Florentine high society. For me, Visitation is a glorious color extravaganza. The rich color contrasts of the gold of the kneeling figure and the blues of the standing individuals, with that bold, gold Renaissance frame encapsulating it, transfigures me. It has been difficult to find an acceptable reproduction for this column. Most were color off and were without the heavy gold frame, which, if not there, emasculates the painting's drama. All the tourists and other first-time visitors make their way to Leonardo da Vinci's La Giaconda/Mona Lisa. I don't, not anymore. I prefer the artist's La Belle Ferronière, which I wrote about in "Duveen Tumult," 21 January 2013. 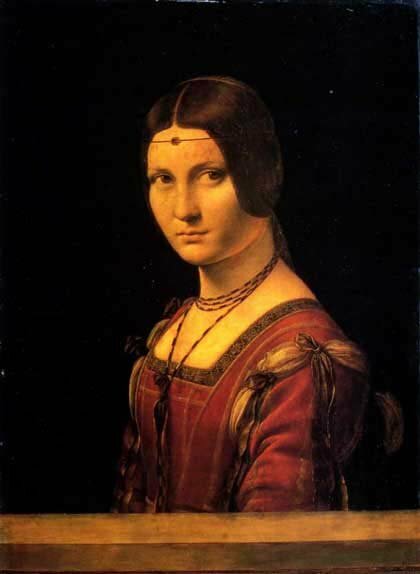 Frankly, I prefer the Ginevra de' Benchi in our own National Gallery. My next preference after the Ghirlandaio is Gericault's massive, powerful, and art-history-shattering The Raft of the Medusa, but since I went into that in detail in my 25 February 2013 column, I won't repeat. Like most French artists of his time, when he entered paintings for exhibit by the French Academy, they had to conform to the Academic tides, which meant painting classical dramas and the events of history. He did outstanding paintings that fell within these bounds. But on most occasions he saw through his own eyes and painted with his own skills. Away from official France, he lived for decades in Rome and Florence. 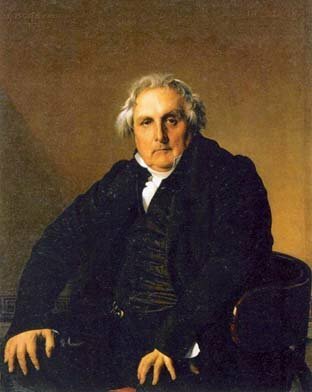 Because he had developed a reputation as a skilled portraitist, the rich English making the Grand Tour pushed him to paint their portraits. So did others. He disliked portraiture, but he had to eat. I intended to take us into the most dramatic room in the Louvre, a display limited to 24 huge paintings extolling the life of Marie de' Medici by Peter Paul Rubens, but that is for another time. Whenever I go into a museum or a gallery with someone else, I often ask the question, "What did you like most?" or "What would you like to take home with you?" That usually elicits interesting discussion. So, the advice of this column: whenever you go to an exhibition, think about what you liked most and what you liked the least. You may be astonished that if you revisit several times; your tastes may change. Now back to that book Hugger-Mugger in the Louvre by Eliott Paul. He wrote another novel which became popular with all who had lived in Paris as the clouds of WWII gathered: The Last Time I Saw Paris. The action takes place in a small, narrowly vertical hotel on the Left Bank, the Hôtel du Mont Blanc. The hotel was near a small, cheap restaurant, Les Balkans, where my companion and I occasionally ate while waiting for Belgian visas in the summer of 1949. As my service in the French Mission came to an end, April, 1951, I secluded myself in Paris cutting and gluing galley proofs for the page makeup of Un Coup d'Oeil Honnête sur les Mormons, which I had written in the mission home in Geneva. It was to be printed in Paris in a Left-Bank imprimarie near the hotel. Un Coup d'Oeil was published as the centennial edition of l'Etoile. It was the first book-length history of the Church favorable to the Church published in French in about 75 years. I worked in this hotel because it was the setting for Eliott Paul's book and I wanted to get a feel of the place. Oh, yes -- hugger-mugger. This is not a term found in a slang dictionary. It's in the standard ones: the act of keeping secret in a jumble; in a secret manner; to act in a confused manner; in a secret or muddled fashion. I hope I've dispelled a little Louvre hugger-mugger.